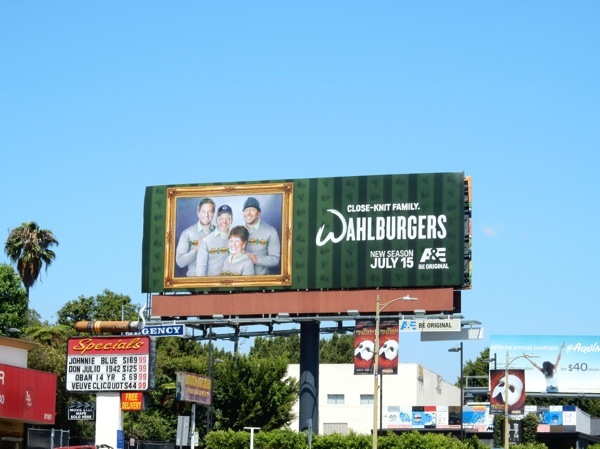 Usually you don't see Hollywood actors starring in reality TV shows until their careers have gone down the pan, but that's not the case with Mark Wahlberg and his family fly-on-the-wall series, Wahlburgers. 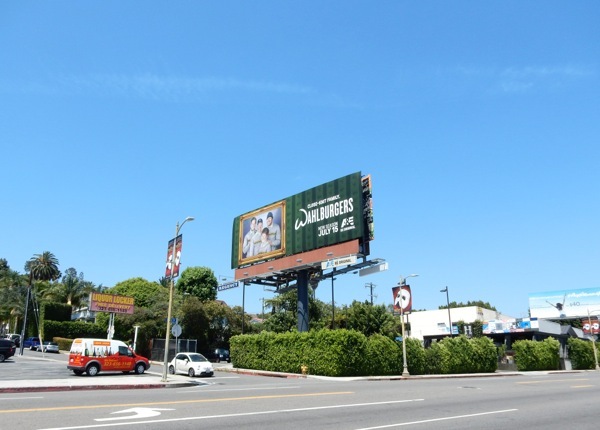 In this fourth season he'll be juggling promoting his new movies Ted 2 and Entourage and balancing his home life with his fashion model wife, Rhea, whilst his brother Donnie is also kept busy with his other reality show back for a second season, Donnie Loves Jenny (which also stars his wife Jenny McCarthy). 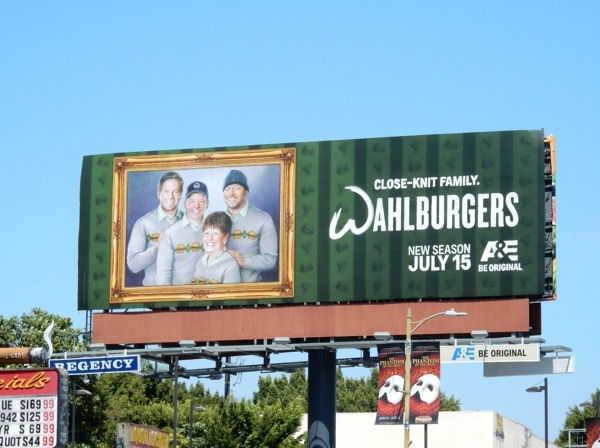 Keeping an eye on the Boston family burger restaurant business (run by Paul) and all her kids in check is Wahlberg matriarch, Alma, who also makes it on to this season four billboard for the show. 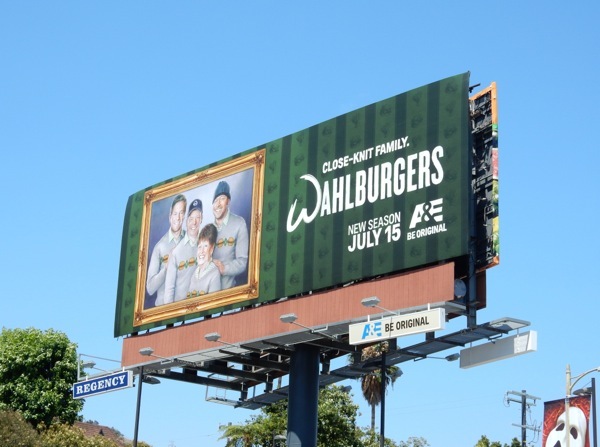 This fourth season family portrait ad creative was snapped along Sunset Boulevard in West Hollywood on July 10, 2015, and if you're a fan of the series, be sure to check out these previous season promo billboards for Wahlburgers. 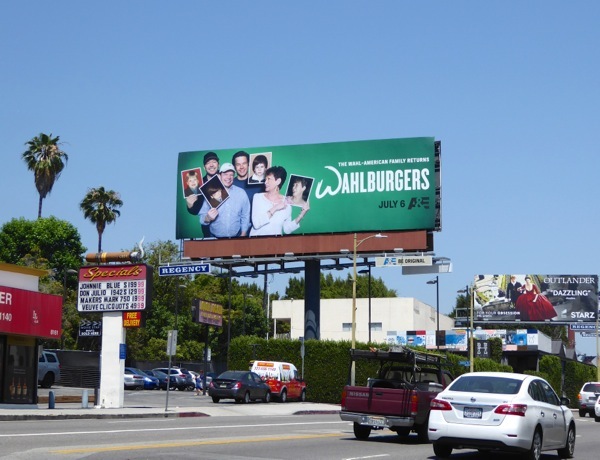 Those matching burger sweaters certainly do make them look like a 'close-knit' family. 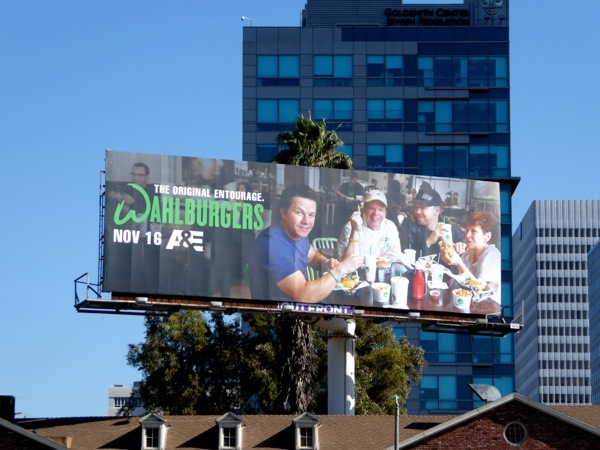 UPDATED: It looks like A&E are doing things a little different and promoting two Wahlberg family reality shows with this Wahlberg Wednesdays billboard. 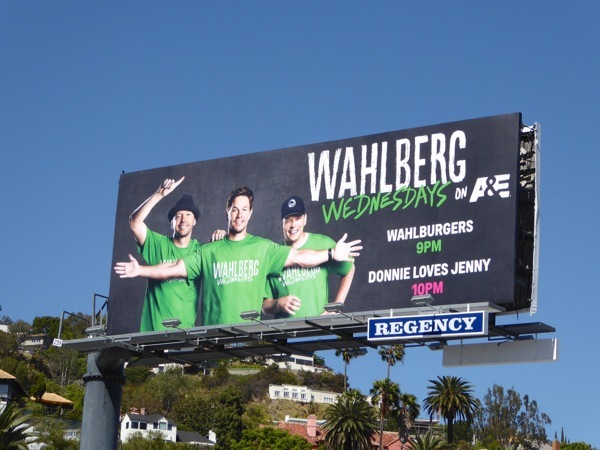 This combined ad creative for the Wahlburgers fifth season episodes and Donnie Loves Jenny third season (which recycles the Wahlburgers season two billboard) was snapped above West Hollywood's Sunset Plaza on March 31, 2016. 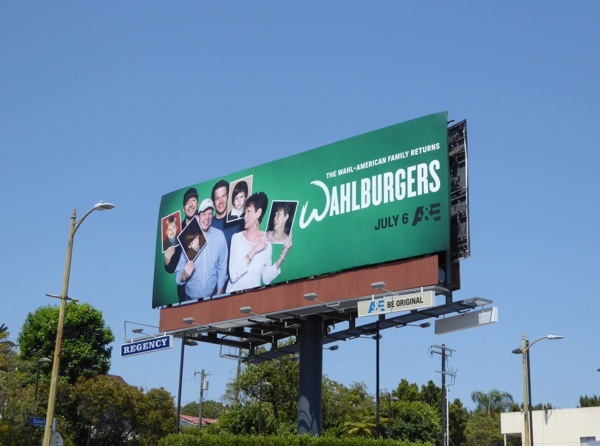 UPDATED: The 'Wahl-American' family returns for a sixth season of reality viewing this Summer with a reminder to when they were all a bit younger. 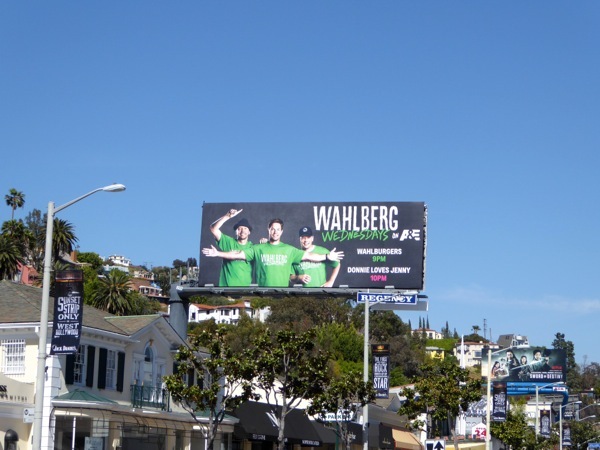 This photo flashback season six billboard for Wahlburgers was snapped along Sunset Boulevard in West Hollywood on June 23, 2016. 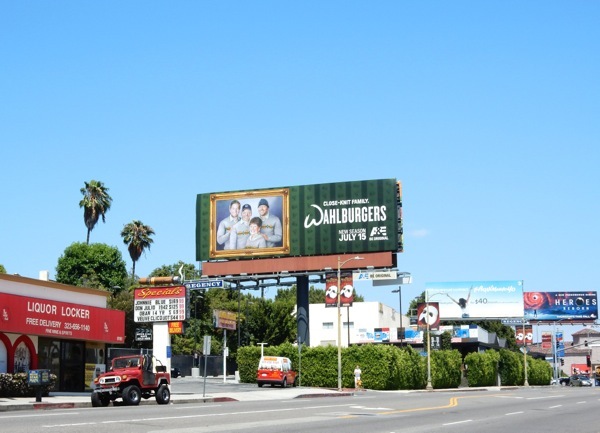 UPDATED: Here's also 'The original entourage' ad creative for the seventh season of Wahlburgers snapped above San Vicente Boulevard on November 30, 2016.